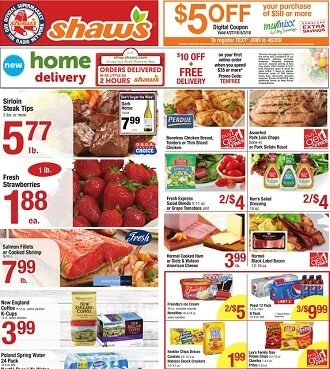 Browse the latest Shaw’s Weekly Ad, valid April 19 – April 25, 2019. Don’t miss the Shaw’s Sale specials and grocery promotions & offers from the current Ad Circular. Find super savings for everything you need for your home and kitchen including Fresh Produce, Fresh Meats and Seafood, O Organics & Open Nature products, Organic Tuscan Kale, Primo Taglio Deli Meats & Cheese, Purina One Dog Food, Hershey’s Chocolate, Organic Potatoes, Sockeye Salmon Fillets, Nabisco Oreo Cookies, and more. Don’t miss this weekly Shaw’s circular deals and don’t forget to print off your coupons before heading out this week to shop.